Fort Phantom Rendezvous, 1999 – 2003. “Butterfield Stagecoach,” which is built to the specifications of an original Wells Fargo stagecoach. The vehicle is pulled by four quarter horses. 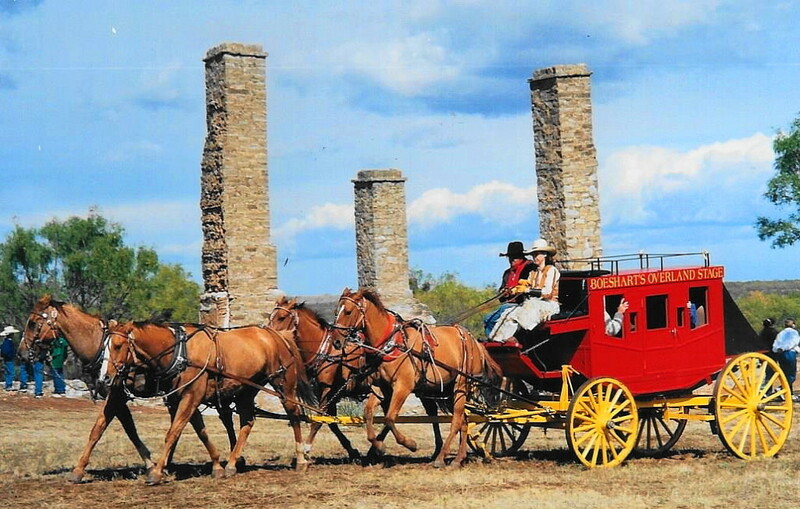 The 2003 Rendezvous had 106 living historians, over 50 camp sites, Indian dancers, Butterfield Stagecoach rides, black powder shooting, and countless other activities. The events of the previous five years had also included a ride in a horse-drawn stagecoach, watching a blacksmith hammer out horse shoes over a coal-stoked fire, and a Native American in full traditional costume demonstrating “flint knapping” (the art of making arrowheads from stone). These are just some of the interesting and entertaining activities that were part of the annual Fort Phantom Rendezvous. This living history event at the historic Fort Phantom site helped people get a first-hand understanding of what life might have been like on the Texas frontier. Each year, over 2000 7th-grade students from area schools visited the Rendezvous during their school days. That’s why Crawford pitched a tent at Fort Phantom Hill the night before the very first Fort Phantom Rendezvous (held on October 30, 1999) and endured the unpredictable West Texas weather, which brought fierce winds, rains and lightning. He even used the same kind of gear the Fort Phantom Hill soldiers might have used – a wool blanket, a buffalo coat, and an old rifle. “I try to be as historically honest as possible,” he explained. Crawford spent the day of the 1999 and 2001 Rendezvous doing just that — sharing his personal “living history” experiences with visitors and talking about what life might really have been like at the fort in the 1800s. He also draws on historical research, studying diaries and journals of people who lived back in those times. Rendezvous 2000 included performances by the world famous Kwahadi Dancers from Boy Scout Explorer Post 80 in Amarillo, Texas. Visitors viewed 50 living historians and vendor campsites from soapmakers, surveyors and saddlemakers to photographers, blacksmiths and flintknappers. There were presentations of cowboy poetry, a chuck wagon barbecue food concession, Native American demonstrations and costumes, stagecoach rides, and much more. In 2001, the newly formed 5th Infantry Living History Organization (the Fort Phantom Garrison) made its debut at Rendezvous 2001. The actual 5th Infantry unit founded Fort Phantom in November 1851 and was in every major battle of the US-Mexican War (1846-1848). Dr. Bob Wetteman, Assistant Professor of History at McMurry University, organized the Fort Phantom Garrison. The 5th Infantry Living History Organization is currently the only organized living history unit actively portraying the 1845-55 period in Texas. The Public History Program and the 5th Infantry are dedicated to the historically accurate interpretation of the 1845-55 U.S. Army and the role of the military in antebellum Texas.